Sony has revealed the free games PlayStation Plus subscribers will have a chance to tackle next month. Following a solid November headlined by Yakuza Kiwami and Bulletstorm: Full Clip Edition, Sony is offering up over-the-top arcade racer Onrush, and the creepy underwater horror game SOMA in December. Check out a trailer for the new additions, below. Strap in for this all-action, gravity-defying, racing game. Drive on the very limits of control in an effort to win victory for your team. This game is action-packed and full of unlockable customization options. Dive into this sci-fi horror title from Fictional Games, the creators of Amnesia: The Dark Descent. It is an unsettling story about identity, consciousness, and what it means to be human. Delve through locked terminals and secret documents to uncover the truth beneath the ocean waves. As a bonus, PS Plus subscribers can also snag the Warframe PS Plus Booster Pack, which includes 100 Platinum, 100,000 Credits, a special rifle, skin, and more! Get more details here. There’s also word going around that select PS Plus subscribers are receiving an offer for three months of free Netflix, so keep an eye on your inbox! This month’s PS Plus free games certainly beat the heck out of the Xbox Games With Gold lineup. 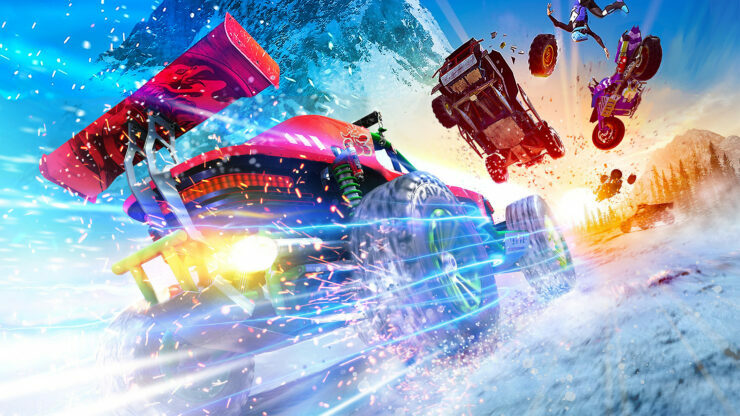 Onrush is a super-underrated romp (check out my full review here) and SOMA is one of the best horror games of the past few years. Oh, and don’t sleep on Steins;Gate or Papers, Please, both of which are fun little innovative adventure games. What are your thoughts on December’s free PS Plus games? Which game will you be tackling first?